Facebook and other tech giants have been under growing pressure to crack down on the spread of misinformation across their platforms. Facebook on Monday announced that it had unpublished four pages belonging to Alex Jones for repeatedly violating the company's standards with inflammatory posts about transgender people, Muslims and immigrants, among other infractions. Facebook said in a blog post that pages belonging to Jones have continued to post content that went against its community standards. Facebook unpublished the Alex Jones Channel Page, the Alex Jones Page, the Infowars Page and the Infowars Nightly News Page. "Upon review, we have taken it down for glorifying violence, which violates our graphic violence policy, and using dehumanizing language to describe people who are transgender, Muslims and immigrants, which violates our hate speech policies," the statement said in part. "All users agree to comply with our Terms of Service and Community Guidelines when they sign up to use YouTube," a YouTube spokesperson said in an email. "When users violate these policies repeatedly, like our policies against hate speech and harassment or our terms prohibiting circumvention of our enforcement measures, we terminate their accounts." Earlier, Apple and Spotify both removed Jones' podcasts from their respective platforms. Infowars' apps are still available for download in Apple's App Store. Jones confirmed on Twitter that he had been banned by Facebook, Apple and Spotify. Twitter remains one of the last major platforms to take action against Jones. 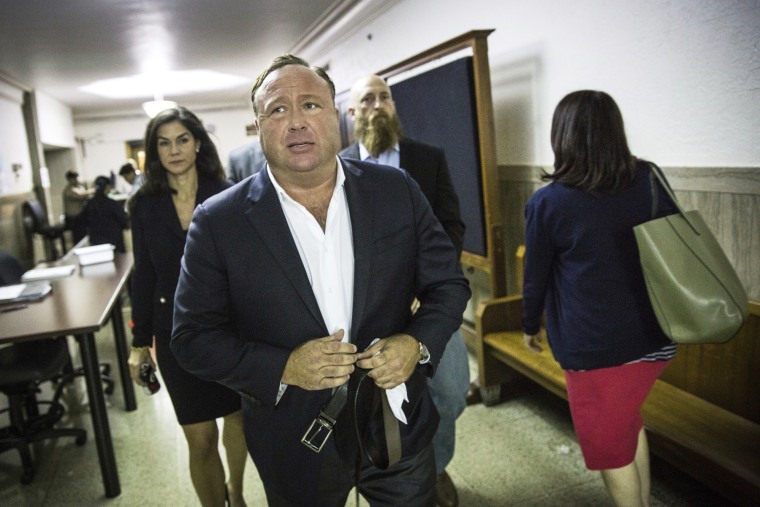 A spokesperson for Twitter said Infowars is not in violation of Twitter and Periscope rules and noted that replies to Jones are often filled with people rebutting what he is saying in real-time. Paul Joseph Watson, an editor-at-large for Infowars, said on Twitter that Facebook's move was "political censorship" and "a culture war." Facebook and other tech giants have been under growing pressure to crack down on the spread of misinformation across their platforms. Facebook in particular chose to give a boost to mainstream publishers and take action against some people and pages that repeatedly violated its rules. At the same time, Facebook has been criticized by conservatives for what they perceive as a liberal bias against conservative outlets. Infowars emerged as a flashpoint in the debate with some journalists and activists pushing for Facebook to take action. Facebook resisted, with John Hegeman, the head of Facebook’s News Feed, telling journalists in early July that the company would be leaving Infowars to its own devices, according to New York Magazine. Jones has the ability to appeal Facebook's decision, according to the blog post. However, if Jones doesn't appeal or his appeal fails, his page will be permanently removed from the site. Jones had been warned that repeated violations of Facebook's community standards would result in having his pages unpublished. Last week, Facebook removed four videos on four of Jones' pages for violating its hate speech and bullying policies, according to a statement put out by the media platform. It also banned Jones' profile from posting to the social network for 30 days. Facebook uses a "strike" system to determine if a page should be removed from its site altogether, according to the statement. It said when a page "surpasses a certain threshold of strikes, the whole Page is unpublished." Facebook does not disclose how many strikes will result in a page being unpublished. The move by Facebook is the latest crackdown on Jones, who has recently had content removed from other platforms. Last week, YouTube removed four videos posted by Jones and issued a warning that more violations could result in a ban from the video platform. Jones is known for falsely claiming the 2012 massacre at Sandy Hook Elementary School was staged by actors. Those claims have resulted in harassment directed at Sandy Hook families and supporters. Families of Sandy Hook victims have filed lawsuits against Jones for defamation. Spotify had also recently come under pressure for hosting Jones' podcasts. “We take reports of hate content seriously and review any podcast episode or song that is flagged by our community," a Spotify spokesperson told NBC News in an email. "Due to repeated violations of Spotify’s prohibited content policies, The Alex Jones Show has lost access to the Spotify platform."